Originally posted: July 10, 2017 . Last modified: April 7, 2019 . 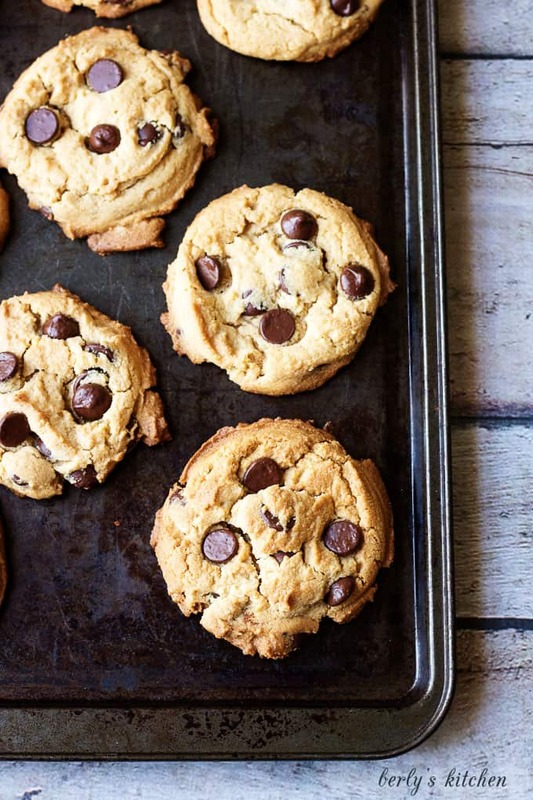 Chewy Peanut Butter Cookies with Chocolate Chips are the best of both worlds. Smooth peanut butter and rich dark chocolate are sure to be a favorite. *This post was first published on 1/2/16 as Chewy Peanut Butter Cookies with Dark Chocolate Chips. We decided to “class up” the traditional peanut butter cookie by adding rich, dark chocolate chips to the mix. Chocolate and peanut butter are such a great combo, but they’re rarely seen together in cookies. What you get is a soft and chewy peanut butter cookie studded with the goodness of chocolate chips. It’s pure perfection! Peanut butter cookies fall into that special group of cookies that are referred to as classics. 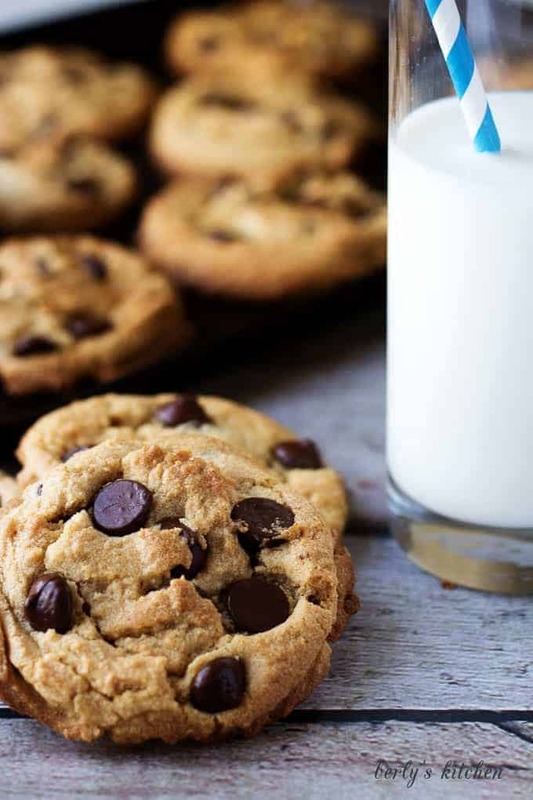 They share the spotlight with oatmeal, chocolate chip, and, of course, sugar cookies. The familiar criss-cross pattern lets you know immediately that the cookie you are about to enjoy is indeed peanut butter. Normally, there’s not a lot of variety when it comes to making the dessert. In fact, the only major difference I’ve found is whether or not to use creamy or chunky peanut butter. That decision is purely preference. For this recipe, I’ve chosen to use creamy peanut butter. Other minor differences include whether or not to use brown or white sugar, eggs or no eggs, and the list goes on. You get the picture. The goal for these cookies was to make soft and chewy peanut butter cookies with chocolate chips that would stay soft for days after they’d been baked. That’s another thing. Do you like cookies soft and chewy, or thin and crispy? If it’s the latter, then this recipe may not be for you. 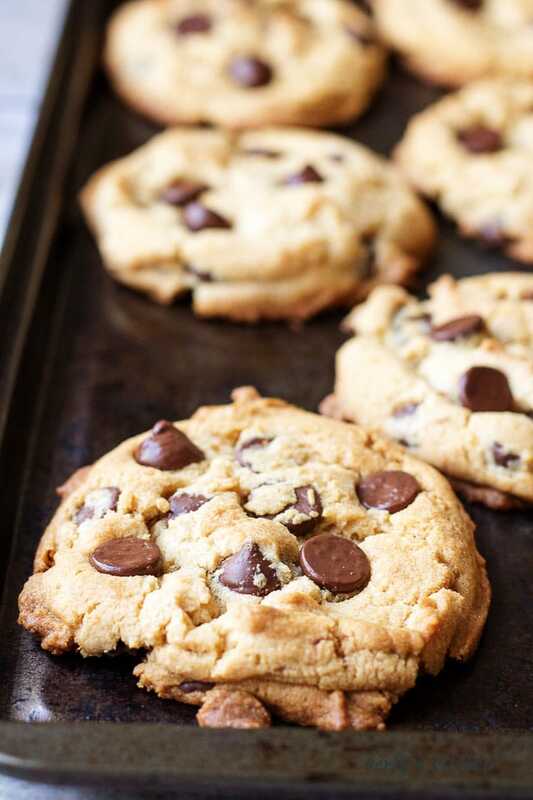 These cookies bake up chewy and stay soft for days afterward if they actually last that long! Lol! 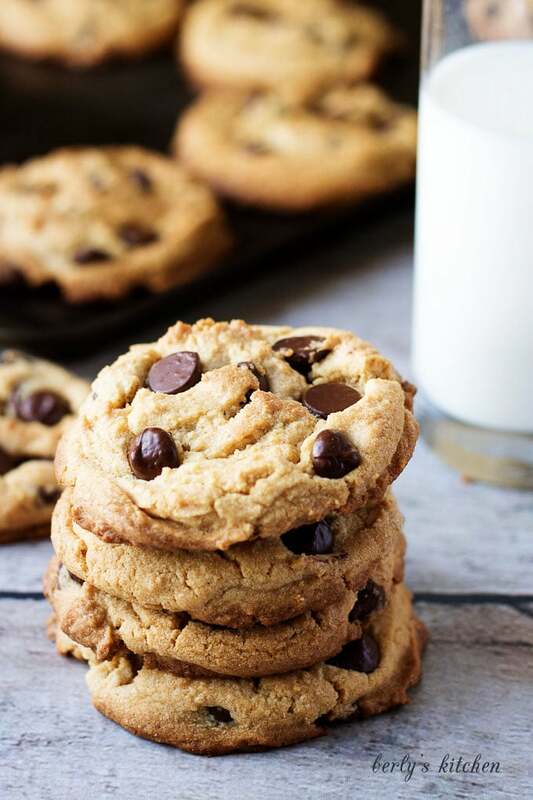 If you want something a little different than the traditional peanut butter cookie, give these chewy peanut butter cookies with dark chocolate chips a try. You won’t be disappointed. If you like this Chewy Peanut Butter Cookies recipe, please leave us a comment and rate the recipe card. You can also find us on Facebook, Pinterest, Twitter and Instagram searching for Berly’s Kitchen! Thick, soft, chewy and simple to make. 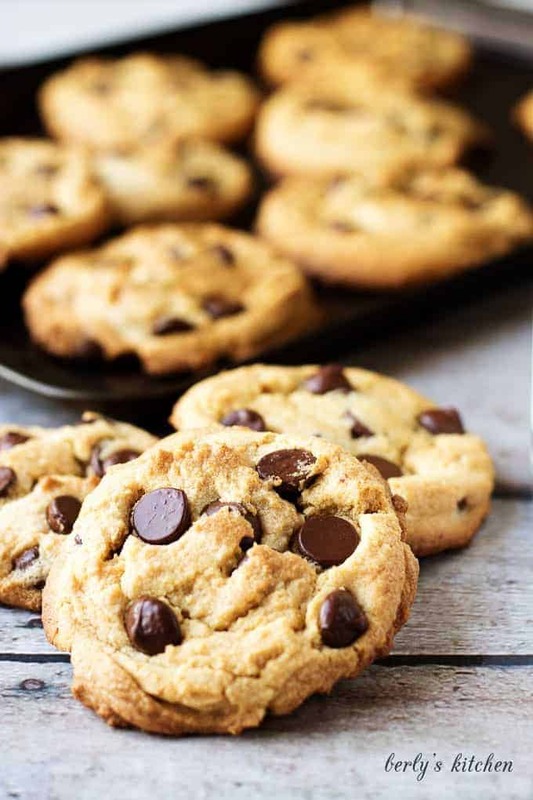 Chewy peanut butter cookies with chocolate chips are the best of both worlds. Smooth peanut butter and rich dark chocolate. Using a hand mixer, cream together butter and sugars. Add egg and vanilla. Combine. Cool in the refrigerator for at least 30 minutes. Prepare a cookie sheet with cooking spray or silicone mat. Scoop dough out of bowl and roll into balls. About 2 tablespoons of dough for each ball. Cookies are done when the edges are brown and centers are soft. *Calories are based on a 2 cookie serving size. Chocolate Chips add so much flavor and texture to peanut butter cookies. Peanut butter and chocolate is a marriage made in heaven and is my favorite flavors when it comes to cookies. YUM! I just shared this on Facebook, tagging my daughter to make them now lol! Those sound so good and I am seriously having a chocolate craving! 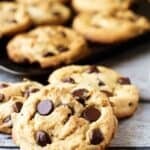 I love chewy cookies, especially if they have chocolate chips in it. This recipe sounds really good. I hope I can make them as pretty as yours. My cookies always end up looking lopsided. LOL. Anyway, thanks for the recipe. School’s out so I have to make sure the kids have something yummy and healthy to munch on. These cookies look so delicious! I’m afraid I’m allergic to peanuts so I won’t be able to try it out. But I bet my husband would love it!